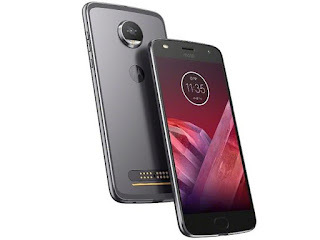 You may consider the latest Moto Z2 Play as the more affordable alternative to the new Moto Z2 Force. It offers similar modular design that enables it do more than an average smartphone can do. Moto Z2 Play also offers buyers powerful camera and battery, amongst other impressive features. This is one device that will likely leave you greatly awed by its svelte profile. It measures just 6 millimetres in thickness. That’s impressive! It’s thinner than big name players such as the iPhone 7 and Samsung Galaxy S8, thanks to the modular design. The 145g Moto Z2 Play shows off a full metal body with brushed edges. Like the Z2 Force, the phone crams in a huge 5.5-inch display with Full HD resolution of 1,920 x 1,080 pixels. This is based on Super AMOLED technology, promising richer, deeper colours. Moto Z2 Play has Corning Gorilla Glass 3 protecting against scratches. The Moto Z2 Play features a 12 megapixel rear facing camera with dual LED, dual tone flash. This shooter boasts both laser and phase detection autofocus. Motorola says this is its first camera to feature both. You also get a 5 megapixel front camera for your self-portraits. The selfie snapper is said to also offer dual LED, dual tone flash and can record Full HD videos. Superb processing power appears on the card here with an octa-core Qualcomm Snapdragon 626 processor onboard. The Cortex-A53 CPU runs along at speeds up to 2.2 GHz. It comes with an Adreno 506 graphics solution and 3GB or 4GB RAM, depending on model. There are 32GB and 64GB storage variants. Storage is expandable with a microSD card. The Moto Z2 Play runs Android 7.1.1. Nougat OS. Talking about the modular design, the Moto Z2 Play supports the innovative MotoMods. You can easily attach a variety of modules or accessories to it to enable it deliver so much more. Examples include projector, camera and speaker modules. You get a non removable Lithium Ion battery with capacity of 3,000 mAh and TurboPower charging support. Motorola promises battery runtime of 30 hours. Moto Z2 Play offers you a front mounted fingerprint sensor with one touch navigation. Moto Z2 Play supports 4G LTE. In Nigeria, the smartphone supports LTE on Etisalat, MTN, 9Mobile, InterC, and Smile. Moto Z2 Play is available in Nigeria, Ghana, and Kenya. You can buy the smartphone at leading online stores in the countries. Moto Z2 Play Price in Nigeria ranges from 186,500 Naira to 250,000 Naira.